This project was funded on 18 Apr 2014! Park and Slide is a project dreamt up by Bristol based artist Luke Jerram. 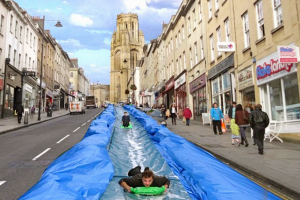 Enabling the people of Bristol to navigate the streets of their city in a new way, this temporary 90m water slide is a simple architectural intervention and a playful response to the urban landscape. 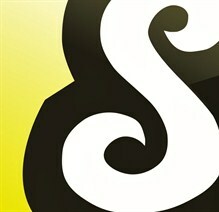 Sign up at www.bristolslide.com for your chance to get a ticket! The slide will be on Park Street, a well-known main street in central Bristol. It’s steep incline and prominent location makes it perfect for the slide site. 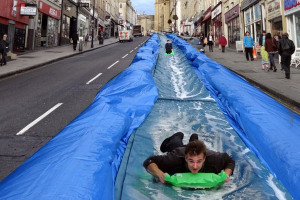 Park and Slide will be presented as part of ‘Make Sundays Special’, enabling people to see their city in a new light. For the event, Park Street will be closed to traffic and dominated by people not cars. The slide will be free for the public to use. Like many of Jerram's large-scale art projects, Park and Slide requires public participation to be activated. The person on the slide becomes the performer, while spectators either side watch on. 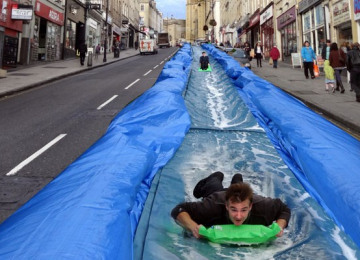 Allow people to slide down Park Street to experience their city in a completely new way! 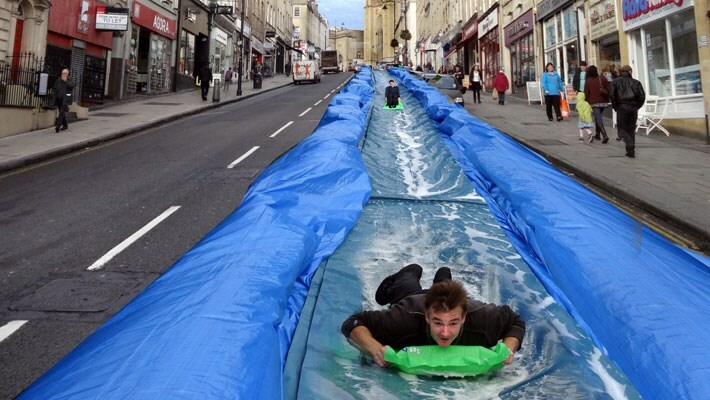 Park and Slide will be a unique and memorable once in a lifetime experience and asks people to take a fresh look at the potential of their city and the possibilities for transformation. 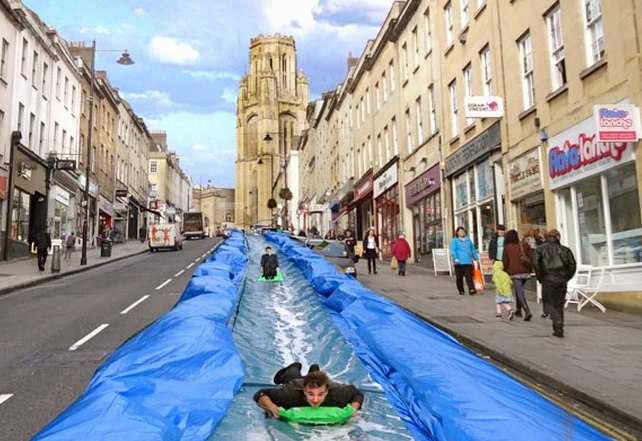 Imagine if there were permanent slides right across Bristol: linking Clifton with Hotwells; Cotham with Stokes Croft. This is our city, and maybe it's up to us to shape its future? 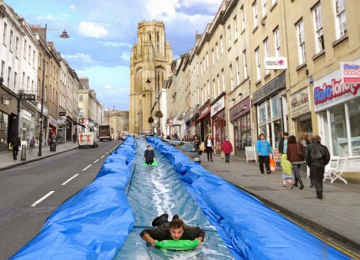 For your chance to get a ticket sign up here >> www.bristolslide.com !! 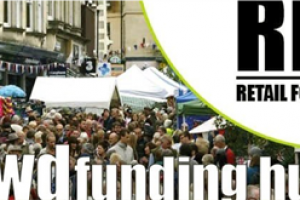 Project management and artist fee for Luke Jerram is being donated in-kind. In the unlikely event the slide has to be cancelled due to really extreme weather we will aim to present the slide again later in the year, but most of the money paying contractors for the first attempt will be lost. Luke Jerram is a Bristol-based artist whose multidisciplinary practice involves the creation of sculptures, installations and live art projects. Living in the UK but working internationally since his career began in 1997, Jerram has created a number of extraordinary art projects which have excited and inspired people around the globe. He is currently Visiting Senior Research Fellow at CFPR, University of West of England. Jerram is known worldwide for his large scale public engagement artworks. His celebrated street pianos installation 'Play Me, I'm Yours' has been presented in over 37 cities so far, reaching an audience to date of over 4 million people around the world. 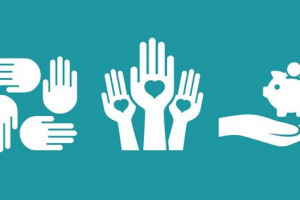 Project Delivery Manager: Luke Jerram The Project Delivery Manager takes legal responsibility for receiving and spending the funds raised and ensuring the project is delivered. Contractor: Luke Jerram ltd The team responsible for building or installing the project.